But with SharePoint 2013 reaching the end of mainstream support in April 2018, more and more companies are looking to the benefits of SharePoint Server 2019, which is currently the latest version. Be aware of the fact that there is no direct upgrade path from SharePoint 2013 to 2019. The upgrade process has to pass the 2016 step to reach 2019. Due to the complexity of the whole process it is always useful to set up a migration plan. 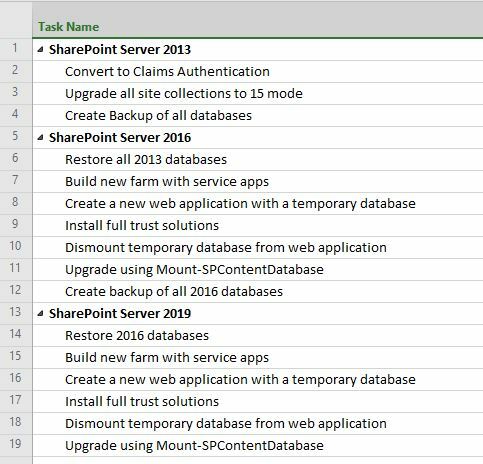 Depending on the state and properties of the source SharePoint farm additional steps may be necessary. The following is a first approach of possible migration plan. If you are planning to migrate a complex SharePoint environment it may be convenient to use a 3rd party migration tool which does not come for free. But this investment could very well pay off during the later migration process.